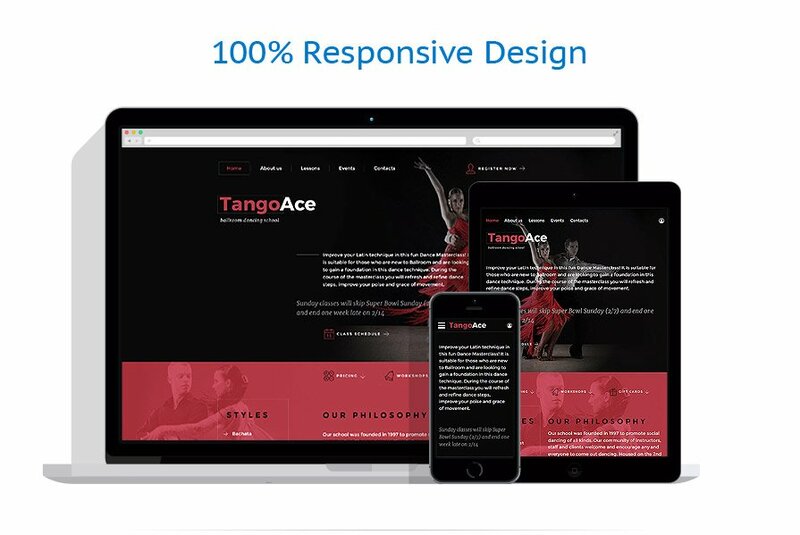 TangoAce is a fully editable and well-documented Dance Academy Website Template, custom made for a dance studio, dancing lessons and courses. Thanks to killer features, it will be beneficial not only for a website owner but also for the users. Create image and video galleries, event schedules and detailed description of your lessons with plenty of ready-made HTML pages. The sticky dropdown menu allows users to navigate your website easily, they can go to the desired page in a mouse click. By means of a contact form, clients can request additional information about your services and reach company officials in a blink of an eye. Using Google widget, future customers will find a company's address hassle-free; this way they can save a lot of their precious time. Choose this template for dance studio, dancing lessons &amp; courses, business &amp; services, fashion &amp; beauty, medical, real estate, computers &amp; internet sites.